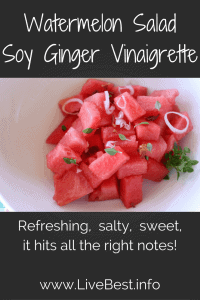 Refreshing, smoky, salty, and sweet, Watermelon Salad with Soy Ginger Vinaigrette hits all the right notes! Remember when watermelons had seeds? If so, you’re showing your age! Seedless watermelons were created about 50 years ago. The majority of watermelons sold today are seedless. In choosing a watermelon, The Watermelon Board suggests giving it the once over. You’re looking for a firm, symmetrical melon that is free from bruises, cuts, or dents. The underside should have a creamy yellow spot. That’s where it sat on the ground and ripened in the sun. After the viewing, pick it up – it should be heavy for it’s size. True to it’s name, watermelon is 92 percent water, which accounts for most of its weight. Once home, rinse the melon in running water, no soap, and pat dry. Cut it with a clean knife. Watermelons can be stored 7-10 days at room temperature but once it’s cut it should be refrigerated. 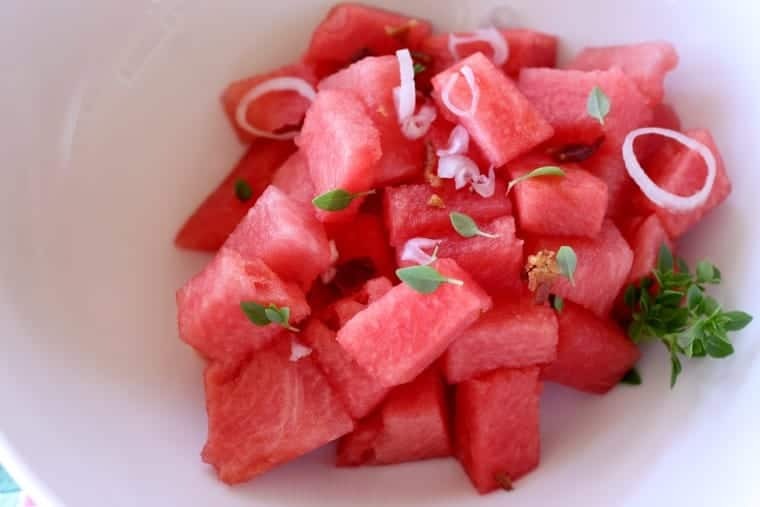 Watermelon is a lycopene leader among fresh fruit and vegetables. A plant pigment found in only a few red plant foods such as tomatoes and watermelon, lycopene is thought to have powerful antioxidant capabilities and may help to prevent prostate cancer and reduce the risk of heart disease. A deep-red watermelon has more health promoting lycopene that a semi-ripe one. Stand over sink and bite into slice. Cut watermelon into sticks (like fries) to dip in yogurt. Brush slices with lime juice, honey, and garlic chili sauce and then grill. 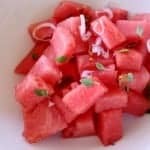 Make a watermelon salsa, instead of, or with tomatoes. Puree cubes in blender. Pour into paper cups. Add sticks to cups and freeze until firm. Watermelon in salads is trendy now. A salad at Stoick & Genuine in Denver was the inspiration for this salad. Refreshing, smoky, salty, and sweet, it hit all the right notes! P.S. If you like this recipe, you may want more nutrish and delish (healthy eating) ones. Sign up for my newsletter here. Refreshing, smoky, salty, and sweet, it hits all the right notes! Make vinaigrette by combining canola oil, olive oil, sesame oil, rice wine vinegar, soy sauce, ginger, honey and pepper. Stir together or shake in a jar to combine. Assemble salad ingredients in bowl. Drizzle vinaigrette over. You’ll have remaining vinaigrette. Refrigerate it for later use.